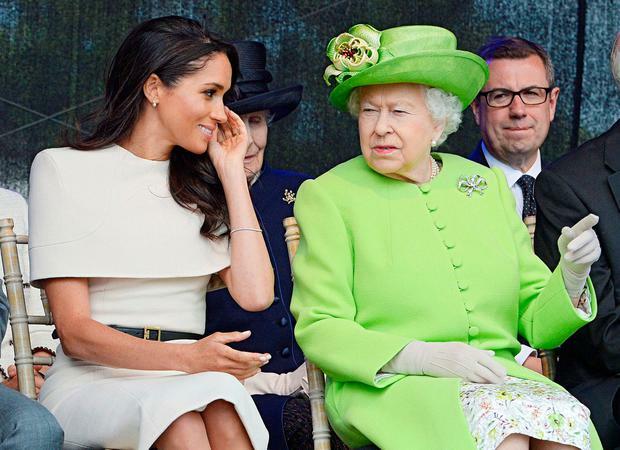 Meghan Markle made her first appearance with the British queen at her side yesterday on a series of public engagements in Cheshire. The former actress, who travelled up to Chester on the royal train with Queen Elizabeth, undertook her first day of duties without her husband, under the watchful eye of her new grandmother-in-law. They stepped onto the blustery platform at Runcorn station to be welcomed with polite handshakes and curtsies from local dignitaries - and wild cheering and applause from hundreds of flag-waving schoolchildren. The Duchess of Sussex's nerves, and lack of experience in the minutiae of royal protocol, were in evidence as they prepared to get into the queen's Bentley awaiting them in the station car park. There was a moment of confusion as the duchess appeared unsure who should get into the car first. "What is your preference?" she asked the queen. "You go first," said the queen. "Oh, OK," said the duchess, who was wearing earrings given to her as a gift by her grandmother-in-law. But as they sat for a ceremony for the opening of the Mersey Gateway Bridge in Widnes, the duchess was seen leaning in and talking to the queen, which produced what appeared to be fits of laughter from the 92-year-old as they watched children perform. They also observed a silence in memory of those who lost their lives in the Grenfell Tower disaster. At her second engagement opening the new bridge across the River Mersey in Widnes, the duchess seemed to have found her stride, deep in discussion with the queen and sharing a joke. The pair spoke to Halton Council officials, architects and engineers and others involved in the 25-year project to create the new toll bridge between Widnes and Runcorn. "It's a magnificent bridge," the duchess told them before joining the queen on a stage to watch a dance performance by local schoolchildren celebrating 1,000 years of crossings over the river.